The 2010 earthquake killed at least 250,000 Haitians, and forced millions to live in temporary shelter in squalid conditions. There are countless large piles of rubble and tent cities to go along with the dilapidated buildings and shacks that exist all over Port-au-Prince and other urban areas. But if it is not clear, it should be mentioned that Haiti was a deplorable place well before the 2010 earthquake; child abuse, trafficking and malnutrition was rampant as long as anyone can remember. Note the following from a March 2008 discussion on the US State Department website: “Despite some improvements, the government’s human rights record remained poor. 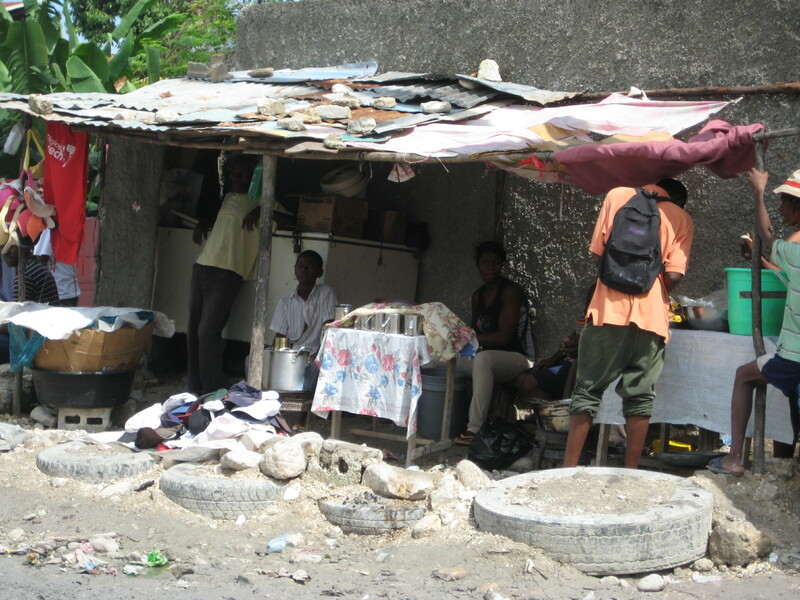 The following human rights problems were reported: alleged unlawful killings by Haiti National Police officers; ineffective measures to address killings by members of gangs and other armed groups; HNP participation in kidnappings; overcrowding and poor sanitation in prisons; arbitrary threats and arrests; prolonged pretrial detention; an inefficient judiciary subject to significant influence by the executive and legislative branches; severe corruption in all branches of government; violence and societal discrimination against women; child abuse, internal trafficking of children, and child domestic labor; and ineffective enforcement of trade union organizing rights…. the government acknowledged the problem of internal trafficking, including that of children. The Brigade for the Protection of Minors (BPM), a branch of the Haiti National Police, investigated cases of child trafficking and monitored movement of children across the border with the Dominican Republic. However, in addition to the lack of specific penalties for trafficking, the lack of resources, training, and institutionalized procedures remained barriers to its operational capacity. There were so many street children in Port-au-Prince who were victims of domestic trafficking that the BPM did not as a matter of routine try to help them. From this American’s point of view, the most disturbing part of this is that almost no one is writing about it! Unless these ugly secrets become well known by Americans, not much will change. Most of the conservative press is focused on cleaning up our own economic and moral messes; the more liberal press seems to be focused on blaming Americans for whatever bad exists in the world. When I contacted the Miami Herald recently, asking them to write about the problem of Haitians Hurting Haitians, I was told that due to the large Haitian population in Miami, they have to tread lightly and be careful what they write about. Apparently articles about poor hurting poor do not sell newspapers. But if I had a story of Haitians helping Haitians, or Americans hurting Haitians, they would be more than happy to write about it. So everyone on the mission team met one or more kids that especially touched their heart for whatever reason. Usually it is one of the beautiful 4-8 year old kids with smiles and bigger personalities. Michelle has followed young Jo-El for three years now, and is haunted each time by his cries when she has to leave. She has not seen him grow very much between mission trips and is working hard at home to get him out of this place. Usually it is one of the beautiful 4-8 year old kids with smiles and bigger personalities. Most of them had pot bellies (unfortunately swollen from poor nutrition and not overeating) and were diseased and filthy, but their desire for love and affection drew us in. Maybe it was a young boy with an effervescent personality who could dance, sing, or just jump around and holler. Or a tender young girl dragging a filthy doll that was too dreadful to be stolen from her. Some of the girls instinctively looked out after the babies and toddlers- they could really warm your heart with the care they provided without much to offer. It is always worse for the women and we had a sense of dread of what the future holds for them. Perhaps one of the infants, usually sick and especially ill-nourished as there was no pedialyte or anyone to give it to them. There were few wet diapers as they did not get enough water to wet the diaper- who would give it to them? Few were drawn to the teen boys, who were relatively strong, were able to come and go and take care of themselves. Fewer still were drawn to the disabled, though we all felt very bad for them. I must admit that I am a very emotional person, and I feel so badly for the disabled that I find it hard to even speak to them. I just nod and smile, and move on my way. But in Haiti everything is different and I felt God taking me in many different directions. I got to meet Jonathan, a blind teen who spent his days alone in a dark room, playing old hymns on an old toy piano. The familiar tunes haunted us a we tried not to think of his awful plight and get our work done, draped in healthier kids who were able to pursue us for attention. But it was Baselais, a 14 year old boy with one leg that I really befriended. He has a warm smile that only leaves when he discusses his disability. 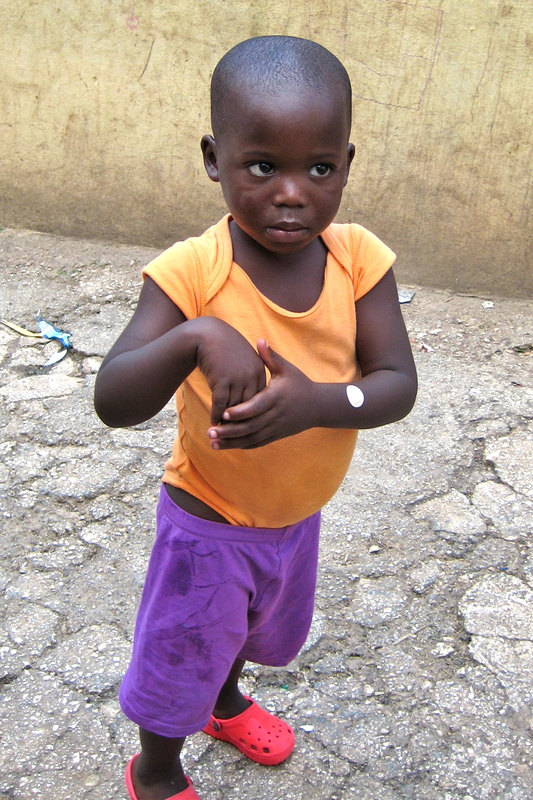 He said that he lost his leg do to a “voodoo trap”: Haitian code for anything bad that happens. It is likely that he had an injury and lost the leg to poor health care or lack of antibiotics. Out of the 71 kids, I chose him to lead a work party on the roof of Rose Mina, calling him “Le Boss!” and telling him he was “En Charge”. His beaming face told me that this was not a common occurrence for the young man. Still, he did a great job keeping the project moving, organized the other boys, and told us who worked the hardest, and who did not. 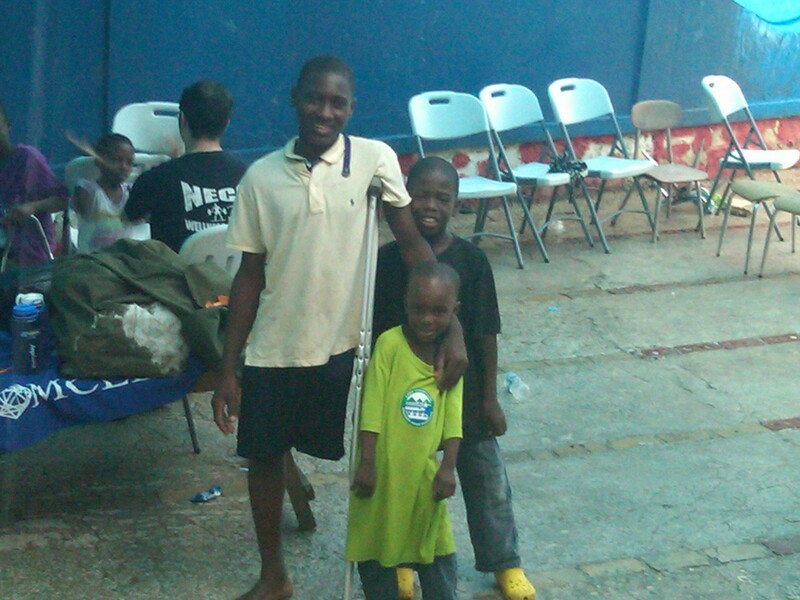 He was smaller than many, had one leg and hobbled on a broken crutch, but still commanded respect from the other kids. This is a kid who needs some help. The other boys were thrilled to get $2.00 for a few hours work over two days. Perhaps out of emotion for his sorry state, I gave Baselais all of the cash I had with me on the last day: about $30.00. I had him video a message to my son James; I taught him our secret handshake. I have been trying to get someone to look after him, and handle money that I wanted to send him. The orphanage could not be trusted with money, so I needed someone else to look in on him. Despite asking several people that I have contact with in Haiti, nothing was going together. Finally today, Jonas lined up a man we met in Haiti named Paul, who agreed to check on him once per week and report back. I sent $150 today by Western Union to get him started. I am hopeful that he will get a prosthetic leg and the training to go with it. I want him to begin to learn English as the most successful people in Haiti speak that language. You cannot be more than a peasant in Haiti if you don’t speak English or at least French. I want them to teach him about nutrition, cleanliness, fitness. Perhaps because of his disability, I want to see him have opportunities that other kids in Haiti do not have. Most importantly I want him to learn about Jesus, and know that any good that the missionaries do for him is out of Christian love. I don’t know where it will lead, as I really can’t speak to him and don’t really know much about him. But I have to trust God who put him in my life and on my heart that some good purpose will happen from my involvement with Baselais. Below is a picture of me and him: he is not smiling as he knows I am leaving. May God lead him to do great things in Haiti! The kids of Rose Mina have very little excitement or activity of any kind to look forward to. So when we wanted to hire of them to clean the debris of the roof that provided the major play area for the kids, I got a great response. Several of the kids worked hard; I put my buddy Basleigh in charge. He lost a leg he said when “someone set a powder” or voodoo trap for him and the “doctors” had to cut his leg off. Payday for the kids. I wanted to hire 5 of them for $2 each. I ended up paying 17 of them. They were pretty excited and I relied on Basleigh to tell me who worked the most. We tried to get some of the kids out of this hell hole, but Mrs. Fernandez refused. 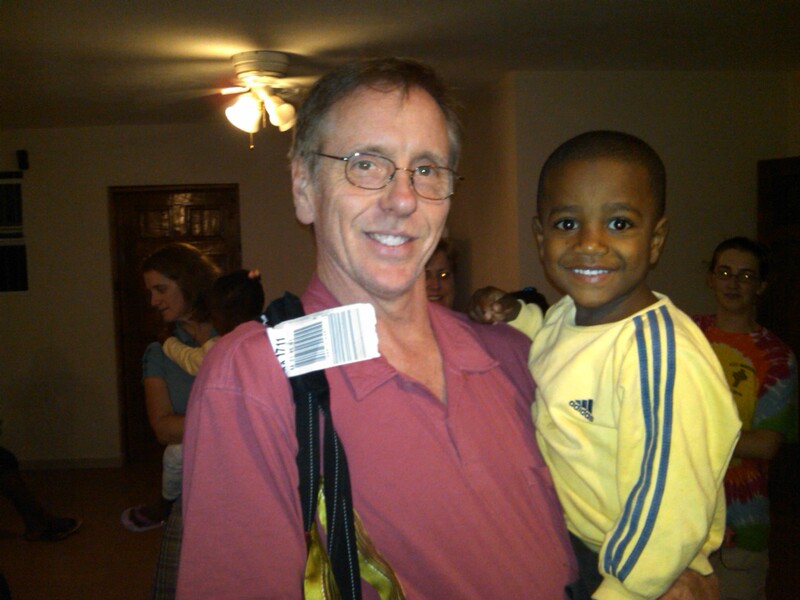 This missionary is still trying to get the boy she is holding, Jo-El, out of this dump so he can be adopted. Many Haitian kids are held captive by their adult caretakers who convince well-meaning Americans and Europeans to donate money, thinking that they are helping the kids. Reflecting on her trip, one of my fellow missionary travelers referred to Haiti as a “nation of orphans”, because they largely do not have a tradition that passes God-given wisdom down to new generations. Haiti has been a basketcase for as long as anyone can remember, as they have not practiced and passed down traditions of diligence, independence, caring for one’s possessions, etc. After spending time there, reading about Haiti, and speaking to many Haitians, I am convinced that nothing will improve without a change in culture. Many billions of dollars in financial aid have been poured into Haiti from all over the world, and things are worse than ever. The earthquake caused countless deaths, massive physical damage and great homelessness, all on top of the problems they already had. But as one veteran aid work put it, “instead of chaos, filth, disease, garbage, and despair, they now have more dilapidated buildings to go along with the chaos, filth, disease, garbage and despair”. The Judeo-Christian tenets of hard work, individual effort, cleanliness and hygiene, order, organization, wisdom handed down to subsequent generations, avoidance of evil, and self-preservation have led to cultures seen by most as “successful”. America’s founding fathers embraced these God-given directives and we have benefited for hundreds of years as the American way of life has led to financial and political stability and prosperity. Many books of the Bible, most notably Proverbs, left sage advice to future generations: Jews and Christians have benefited from this, as have all who lived under these principals. Our traditions of liberty and independence, freedom of speech, individual accountability and private property ownership have developed over the years from biblical teachings. It is no wonder that this God-inspired teaching have resulted in tremendous prosperity to whatever nations embraced it. America does not have a sole claim on this teaching, but has certainly made the most of it in the last couple hundred years. 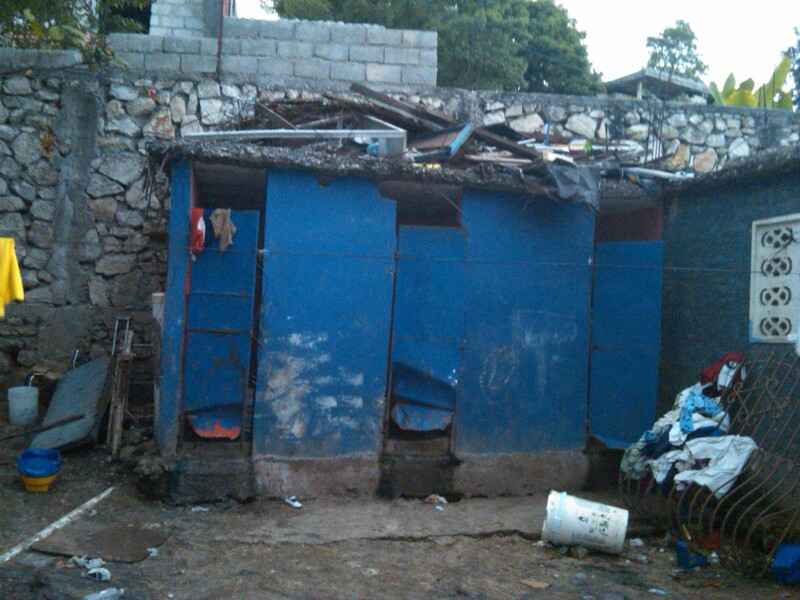 Haiti on the other hand has embraced a survivalist mentality: nothing ever gets built properly and people do not take care for their future as they are always living in crisis. The United States and other prosperous nations that keep Haiti afloat and from complete anarchy should insist that some of the God-given wisdom in our culture should be utilized in using the funds provided. Their culture is dysfunctional, and has ruined their side of the island and the lives of its citizens long enough. Their way of life can only lead to more poverty, suffering and death. Our plans to work at Hope for the Children of Haiti changed as we found that a very large mission group was working there at the same time. 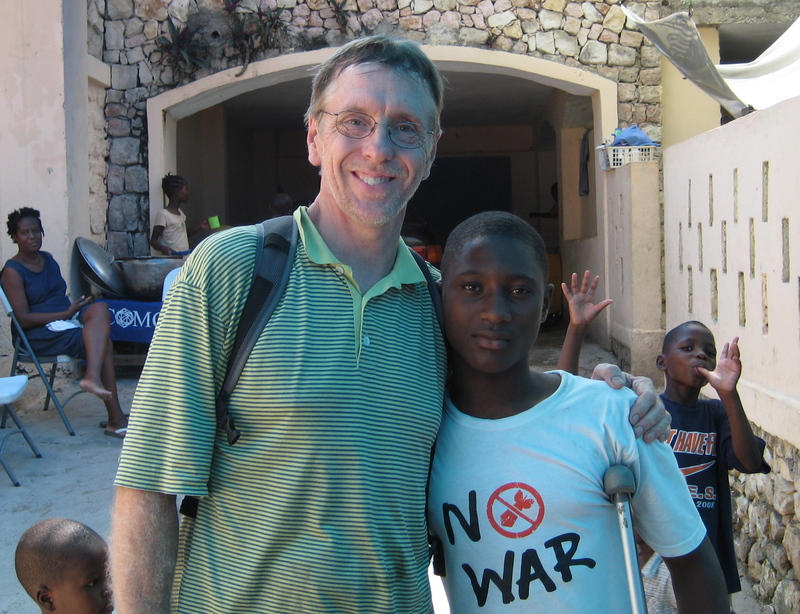 It was uplifting as we encountered many mission groups and volunteer medical teams wherever we went in Haiti. That may have been why we did not experience any racial hostility, as the only white people we met were there to help Haitians on a volunteer basis. In order to best use our time in Haiti, some of us decided to work at another orphanage in much more desperate straits: Rose-Mina, an unapproved orphanage run in her home by Mrs. Fernandez (www.frdhaiti.org). Our sister Church, Grace Chapel has been supporting Rose-Mina for some time, giving them money to get the kids medical help, for building repairs, and for supplies. To hear her tell it, Mrs. Fernandez has taken in the kids, along with an occasional widow out of Christian love. She offered to take us to two additional locations where she runs other “orphanages”. Although she claims to be a pastor of some sort, we never saw her once interact positively with the children in any manner. When we got to Rose-Mina, she cried the obligatory tears, told us how wonderful we were and that we came just in time! We tried to believe her, wanting to give her the benefit of the doubt under such difficult circumstances. Dr. Bernard, who also helped Mrs. Fernandez many times, advised us against helping her due to her questionable business practices and poor conditions for the kids. We still hoped that it could be turned around as we feared the children would be put on the streets. 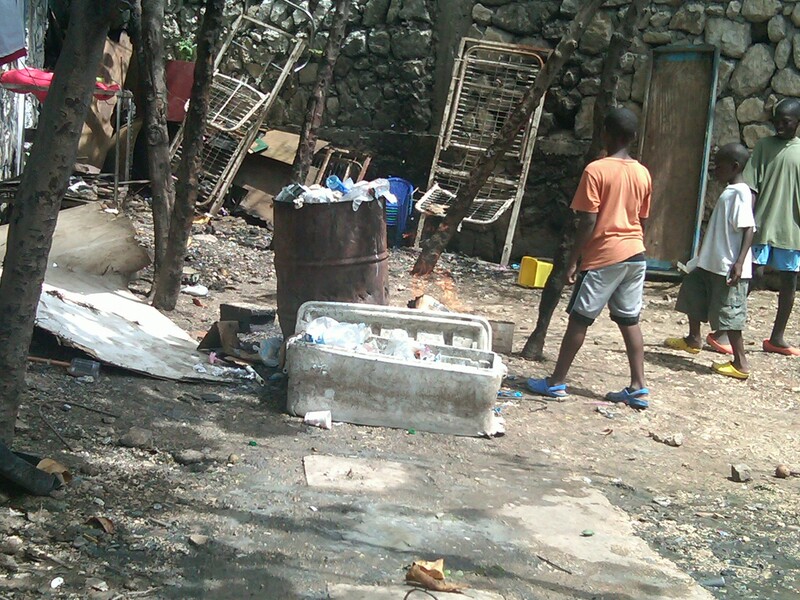 When we saw 71 filthy, malnourished kids living in the open covered courtyard of a small home with no running water, no supplies, a dangerously filthy play area covered with sewage, rat-infested dirty latrine, rancid oils in a small open “kitchen” with flies covering everything, we realized that even by Haitian standards, this was deplorable. When her son-in-law Ernst pulled up in a white BMW to pick up some of his things, our shock turned to revulsion. 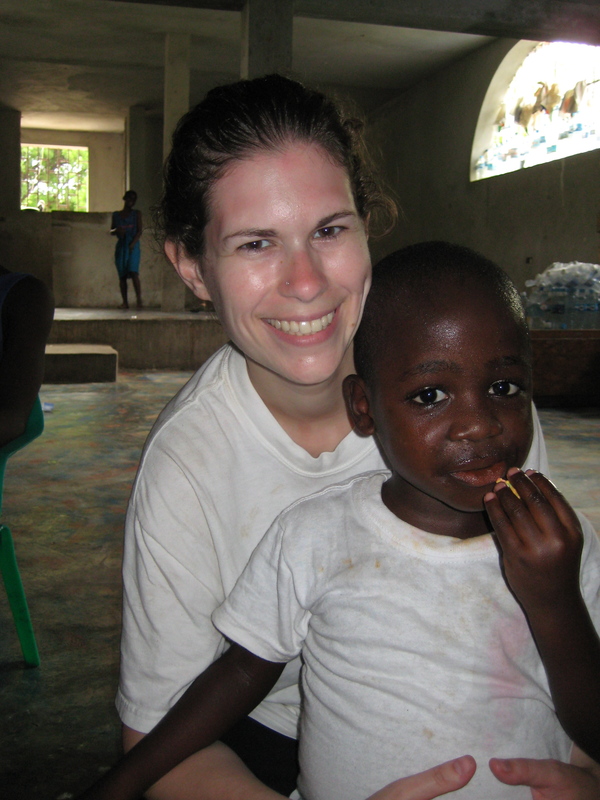 All of the children had ailments including skin diseases, rashes, parasites, and were very dirty. Our nurse Marnie held back tears as she told us that there was no point in treating most of these kids for communicable diseases, parasites and infections as they would just get the ailments back as soon as we left. We were there for six straight days and most of the kids had the same clothing on the entire time. At the insistence of Grace Chapel, Mrs. Fernandez hired a few local workers who occasionally would bath the smaller children. Since it was the rainy season, some of the kids would be showered by the runoff from one of the leaky tarps during storms. When the clothes were washed, they were laid out on the filthy roof to dry. Among the children were: two very sick infants who were not getting any liquids or nutrition; a girl whose head was enlarged from an untreated ailment; many toddlers with hard, bloated stomachs from malnutrition; a young teen who had a leg amputated but could not get to the free American clinic to get a prosthetic; a young girl with a mild case of Cerebral Palsy that was getting worse because she could not get to a clinic to receive physical therapy; a blind teen was kicked out of the school for the blind due to lack of funds. The blind boy, Jonathan, spent his days playing familiar hymns on a toy piano the entire time we were there. He had almost no interaction with any other children. I am haunted by the thoughts of what he will do with his time when the batteries run out. When these examples were pointed out to Mrs. Fernandez, she simply stated “the kids are fine and I want nothing to do with any clinics!” When Jonas gave her $100 to take the infants to the clinic, she said she would. When we came back the next day, she kept the money but had not taken the children to the doctors. The babies also were not there. Despite significant investments by Grace Chapel, each year that they return they find even more kids in this make-shift orphanage and the kids in more desperate straits. We found piles of donated water bottles scattered around the house; boxes of medical supplies that were damaged from improper storage; a cistern with an insecure cover that one of the children recently fell into. A child apparently died at the orphanage last year, but we could not get information on the circumstances. Mrs. Fernandez always offered a number of excuses, but this was something of a final effort for Grace Chapel. They hated to pull their support because of the kids, but it became clear as we worked there that this was a profit-making business for Mrs. Fernandez and not the humanitarian effort she pretended it to be. (It is my opinion that she belongs in jail doing hard labor, not in responsible charge of beautiful children). Still, since we were there, we wanted to make things better for the kids as a whole, and perhaps a lot better for a few of the kids. So our plan was to clean the filthy place, get the water system working, build and stock a pantry, and were considering paying for the electrical lines to be brought in. The video of the grounds I show here is only a few of the videos I will share unedited. We set up our base of operations at Bethel House, a large, secure missionary retreat in the mountains which provided a great base for the mission teams. The retreat, secured by a large gate, concrete wall and barbed wire, can host up to 150 Christian lodging guests at a time. Amazingly, it even has a chlorinated swimming pool, which we all used each day to disinfect ourselves after a day in the city. The Free Christian team included Marianne, a chemist who is on the board of one of the orphanages; Dana, a Raytheon engineer; Cheryl H., an environmental consultant; Marnie, a nurse practitioner, Jill our organizer, in addition to myself. Marnie immediately became a critical team member, as several missionaries got sick. Grace Chapel added Michelle, a veteran of four Haiti mission trips; Trevor, an electrical engineer, Stephanie, Julianna, Cheryl F., Dave, and Aaron who were, like me, making their first trips. Cheryl F.’s fluent French was invaluable to us. Our interpreter and leader was Jonas, an ex-Haitian business executive from Boston who supports many children in Haiti, and makes regular trips. Without his fluent Haitian Creole, French and English we would have been lost. Each day we would travel out of the mountains in early morning, spend hours in traffic or in stores looking for supplies, not reaching our destination until at least 11:00 a.m. We had to be back on the road well before dark, as an already dangerous city becomes extremely dangerous. In today’s Haiti, many parents try to get their kids into orphanages where they can get food, medical care, housing and education. Sadly, if they disown their own kids, they know that it might be their best chance for survival. They might tell their kids to lie and state that their parents are dead. At a legal, well-run orphanage, spartan as they might be, a child would get stability, shelter, food, education, care, discipline, security and perhaps a little kindness. On the streets, waiting for them is a perpetual striving for shelter, food, and safety in a dangerous, polluted environment, with little chance for work or opportunity. I noticed it was especially tough on the girls and women. But there are not enough legal orphanages, especially for the newborn and the teenagers. The newborns are difficult to care for, it is harder to feed them and are more likely to get gravely ill from malnutrition. We saw many malnourished infants. The teens eat more, are more difficult to control and even harder to get adopted. Once they turn 16, under Haitian law they cannot get adopted. The toddler to eight year olds are those that attract the most interest and get the best donations from prospective adoptive parents. They still look somewhat fresh and show the potential ability to thrive in a different environment that might be offered to them. Amazing as it might sound, some orphanages, are reluctant to part with them. The unlicensed ones in particular, need the younger children to draw donations from abroad. When we left for Haiti, our plan was to do construction work at the Hope for the Children of Haiti (HFC) orphanage and school (www.hfchaiti.org) in Bolosse, an impoverished neighborhood in Port-au-Prince. We also planned to do some construction work on the homes of some of the widows that work or teach at the school. These are actual people in desperate need, and I was interested in hearing their stories and understanding their plight. HFC, and New Life Link (www.newlifelink.org), an orphanage and nursery for younger children, were founded by Dr. Jacob Bernard, a Haitian-American who returned to his country to help impoverished children. Dr. Bernard also runs Bethel House. We found both of those orphanages to be reasonably well run under poor conditions in the country- but not by American standards by any means. The school-aged children are getting ample food, a good Christian education, and a large dose of love and care. They generally can speak some English, while fluent in French and their native Haitian Creole. Some of the HFC kids hope to eventually seek an education in the United States, while the younger kids at New Life are mostly scheduled for adoption by Americans or Europeans. Dr. Bernard recently adopted 10 of the kids at HFC, as they were just about to turn 16, the age barrier that prevents the kids from being adopted. While it is very difficult to choose who to adopt and who to support, Dr. Bernard makes it clear that he adopts those that he believes will have the best chance of having success at the next level. That might mean a meager career in Haiti, or a college education in the United States. There is around 80% unemployment in Haiti, so not much is here for them. We brought HFC much-needed medical supplies, money, food, clothing and other necessities. In addition to normal protein foods like peanut butter and tuna, we brought flip flops, church clothes, underwear, towels, shoes, deodorant, shampoo, shoes, lotion, toothpaste, soap and feminine products for the girls. 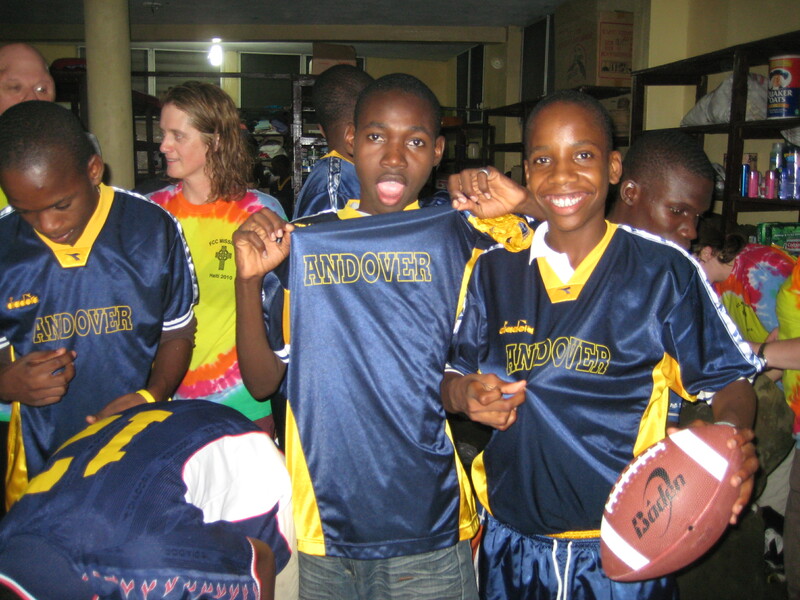 We even brought some of the HFC boys soccer shirts from our home town of Andover. 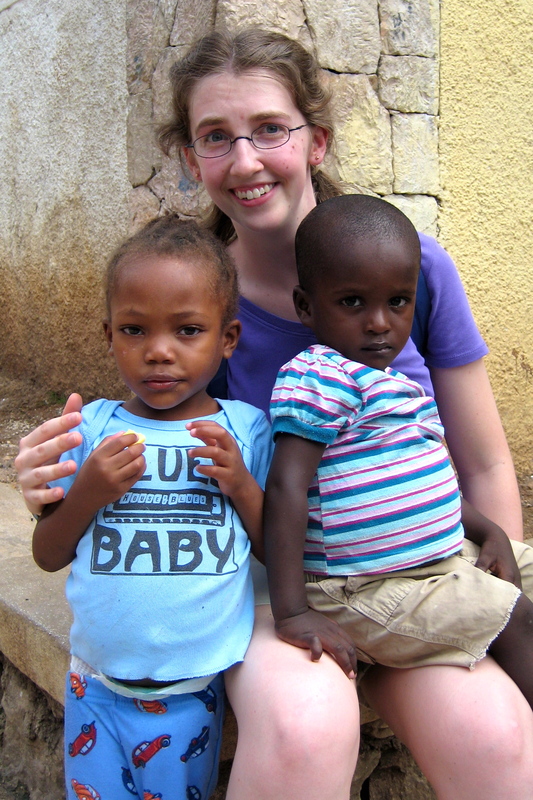 (See photo) With the shirts on, they look like any other American kid, free from poverty and language barriers. The kids at both orphanages are desirous of interaction, especially the smaller kids, and we enjoyed playing with these wonderful children. The saddest part is, if we could bring a child home with us, many of us would have. 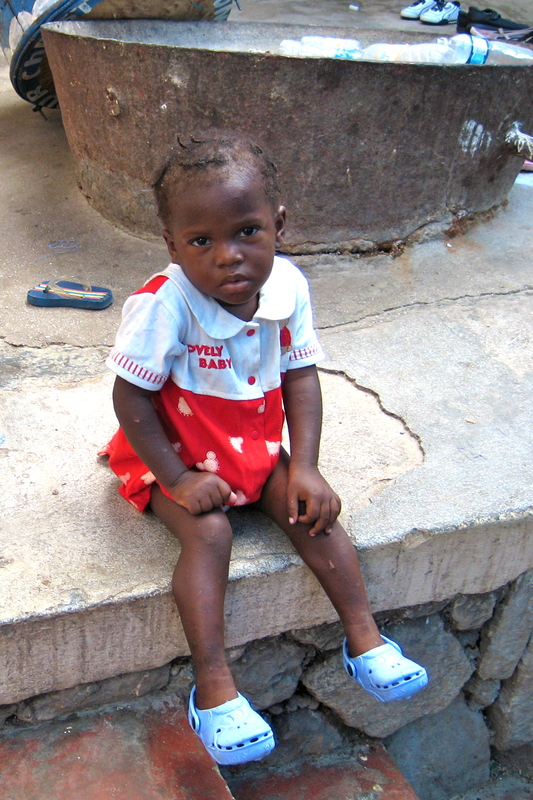 But the archaic adoption laws in Haiti can stretch the process to as much as four years! It was temporarily shortened for humanitarian reasons after the earthquake, but is back to the same bureaucratic nightmare it generally has been. There would be many more adoptions, but couples need to be married for at least 10 years and be over 35 years of age, for example. Dr. Bernard hoped that we would get to know the students personally and perhaps develop a life-long relationship with the school. Several of our group support specific children financially. It costs somewhere around $200 per month to support a child in school, food, clothing, etc. Some pay all of the cost, some share the cost with others. The older kids at Hope for the Children of Haiti understand that a sponsor from afar is paying for their stay and education, simply out of Christian love and concern. It is heartwarming to see the kids glued to the side of their sponsor whenever they are around. They know that this selfless effort means the difference from a dangerous life on the street, and the relatively comfortable life and schooling at HFC.